During my time interning with Hagerty Insurance Agency I managed this project aimed to establish behavioral use of mobile devices in public spaces to inform the company's mobile platform. This ethnographic project utilized qualitative and UX research methods and is broken down into two parts; the first focused on discovery and the second concentrating on applying these discoveries to car enthusiasts. While it may seem obvious how people use their mobile devices from day to day, the specifics of how they actually use their phones, when, and to what end are not always what’s assumed. Understanding these specific aspects of usage is important in order to design for this increasingly mobile first world. Hagerty was interested in knowing more about how people use their phones in order to determine how they could utilize mobile devices for the company mission and design solutions with mobile first in mind. To do this I utilized best qualitative practices and UX research methods, gained experience with project management, and led research from discovery to completion to inform the company’s mobile platform. This project began with the very broad goal of determining how people use their phones in public spaces. Eventually I was to apply all research to car enthusiasts and Hagerty's area of focus, but only after determining the broad uses and where they would lead me. I began this discovery phase by completing field observations, coded observations, and user interviews. After mapping out my initial field observations, based on my findings I decided to complete more detailed, coded, observations in two coffee shops. Based on previous observations, I narrowed down what I wanted to learn more about. 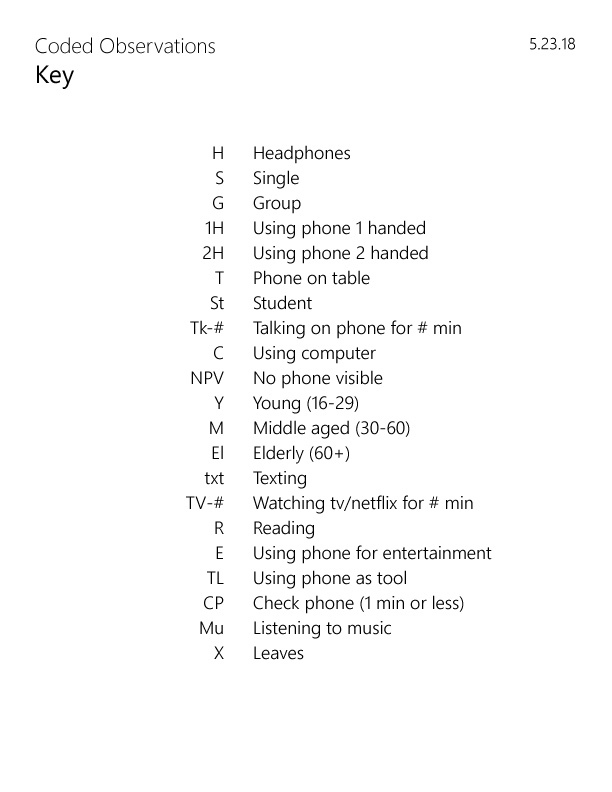 After creating the flow below, I conducted the survey and gained details about how people depict their own device usage. I then compared how people view their own usage to how I observed them using their devices in the observations. Using all previous observations, interviews, and survey results, I created the diagram below to determine the overall theme of mobile device usage. Building from bottom up, I was able to determine 3 overall themes - entertainment, connection and assistance - and that these all influenced the users quality of life. Now that I understood how people were using their phones, I created four personas to depict the main user types I found as well as a journey map to get a more detailed view into how a someone might use their device in a coffee shop. At this point in the project I realized that I wasn't getting what I needed out of the research so far. I decided that to apply the project to classic cars I would need to do some more focused research. After mining data from a survey previously conducted by a Hagerty coworker, I narrowed down what I still wanted to learn more about: how classic car owners and enthusiasts connected with the classic car community and details into how they cruised in their vehicles. To learn the answers to these questions I created a survey as well as conducted several user interviews, both limited to of classic car owners or enthusiasts. I then took all responses and created an affinity diagram to determine the area of concern which could lead me to a problem statement. I found that all responses led to one common theme: enjoyment. Classic car enjoyment can be improved through clearly defined purpose, being prepared and being engaged. Based on my problem statement, I decided to ideate two app ideas. The first is a navigational app dedicated to classic car cruises, focused on helping enthusiasts find the best cruising routes, leaving reviews for routes, and allowing them to be aware of any hazards along their route especially hard on classics. The second is a planning app to aid classic car communities in planing group rides, creating an easy way for groups to communicate, decide on routes, take polls, and navigate together. I did sketches, including crazy 8 exercises, but due to a time constraint, this is the extent of this project. Following this project, this research was handed off to the team to keep for future use regarding mobile design. Through this research I learned how to effectively manage a project as well as how to utilize best UX research methods and qualitative practices. While I ended up having to do a second round of research because my first round didn’t give me enough to work with, it taught me how to more effectively narrow my goals and that sometimes you just have to do more research and go further than you thought you would to get the answers. "Olivia interned with our team at Hagerty during the summer of 2018. She took the lead on her UX projects whenever she could, using our team as a resource. Olivia strived to help our team, taking on as many projects as she could muster, also knowing when to respectfully decline. Watching her grow and discover the UX process in the workplace, I saw a passionate and compassionate individual well suited for the field. As her mentor, I helped Olivia on several projects, including researching the use of phones in public spaces. When we later discovered that we would need to conduct additional research, Olivia was ready to pivot. She has grown much since the beginning of her internship, now leaving with additional skills in user research, interviewing, affinity diagramming, and more. Like any intern, she required more assistance in the beginning, but Olivia quickly took off on her own and integrated herself into our team. Olivia is a self-motivated learner and worker, who recognizes when to reach out for guidance. She proved to be an insightful addition to our team. Olivia and her UX skills would be a valuable addition to any team." "Olivia joined the Hagerty Digital Commerce team as a UX Intern over the summer. Her primary focus was to gain greater familiarity in conducting observational user research and to work on her prototyping skills using Sketch. Olivia was a detailed oriented contributor and it was great having her on our team."